Since the 16th c. designs for embroidery were delivered by the means of printed models mostly in books. Only since the early 19th c. coloured patterns came into fashion. They were less expensive and could be distributed in quantity. Publishers in Berlin, Vienna, Nuremberg spread them all over Europe. 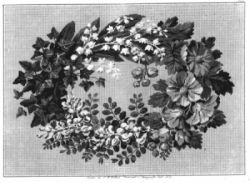 Different flowers arranged in bouquets, garlands, wreaths are represented on these single leaves. Botanical accuracy was important, but butterflies and birds also belonged to the motive program. Besides there were reproductions of pictures and with this help large embroideries could be realized. The counting of the stitches was made easy by printed and coloured designs on squared paper. At the same time these patterns gave an impression of the colours of the finished objects. They adorned pillow covers, bell-puls, tobacco-pouches, wallets and similar objects. 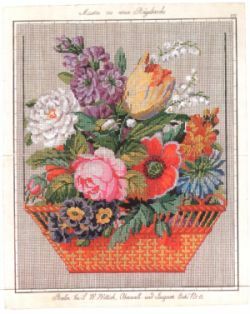 The exhibition will show around 50 patterns as well as several objects that were embroidered after them. The pattern are not only beautiful to look at they also show the blooming sense of family and friendship of the first half of 19th c., the retreat into the security and cosyness (comfort) of the house and of private live. These embroideries point to the part of women who at that time were patient and endurant, following rules and odds.